B. Riley & Co. and The Sugar Ray Leonard Foundation recently presented The 4th Annual “Big Fighters, Big Cause” Charity Fight Night to benefit The Sugar Ray Leonard Foundation in its support for Juvenile Diabetes Research and The Wounded Warrior Project. This prestigious invitation-only Red Carpet event took place at The Santa Monica Pier on May 21, 2013. This year’s attendees included: Sugar Ray Leonard (Boxing Legend, Olympic Gold Medal Winner, Six-Time World Champion), Tommy Davidson, Usher (Recording Artist; The Voice), Billy Bush (Access Hollywood), Adam Rodriguez (Actor, Magic Mike), Sergio “The Latin Snake” Mora (World Boxing Champion), Johnny Gill (Recording Artist), Barry Bonds (retired MLB player), Andre Berto (Professional boxer; Two-time Welterweight Champion), Baxter Humby (Canadian Champion Kick boxer), Benito Martinez (FX’s Sons of Anarchy), Clyde Carson (Recording Artist), DeVon Franklin (SVP of Columbia Tristar Pictures, Author of the bestselling book ‘PRODUCED BY FAITH’), Dondre Whitfield (ABC’s Make It or Break It), Edwin Hodge (Actor, Red Dawn), Franchesca Robi (Songstress, Singing the National Anthem for the night), McKinley Freeman (VH1’s Hit the Floor), Robert Knepper (CW’s Cult), Rory Cochrane (Argo), Sheriff Lee Baca (Sheriff of Los Angeles County), Tamala Jones (ABC’s Castle), and many more! Tommy Davidson was the Master of Ceremony for the evening, which featured a Professional Boxing fight card commissioned by the California State Athletic Commission. Songstress Franchesca Robi (daughter of The Platters’ Paul Robi) sung the National Anthem to ring in the fights. The fight card consisted of four professional bouts. It was a special treat having Sugar Ray Leonard and Usher together, as Usher will depict Sugar Ray Leonard in upcoming biopic “Hands of Stone”. 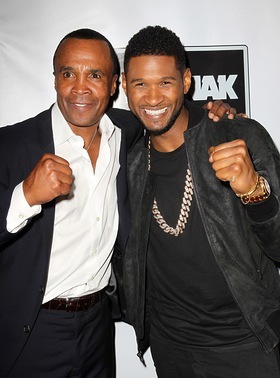 Sugar Ray Leonard and Usher showed off some moves in the ring and were soon joined by other celebrity guests. The event’s targeted audience of over 1400 guests comprised of C-suite executives from nearly 200 public companies across a range of sectors, leading institutional investors, high net worth individuals, financial services professionals, celebrities, sports legends, and other high-profile individuals. Zota Pop, a Top 40s band comprised of world-class musicians, provided musical entertainment along with DJ BABY CHINO, the 10-year-old DJ phenomenon who has been seen on Nickelodeon's hit show “Figure It Out”. Rusnak, Maserati, BMW and Porsche, part of the Rusnak Auto Group proudly supported the Sugar Ray Leonard Foundation. Sugar Ray Leonard honored honor Medtronic, Inc. by presenting an Award in the ring for its work in Juvenile Diabetes with the Insulin Pump. The Hauser Insurance Group was also a proud supporter of the cause. The evening was set against a rich environment for both charitable and business development opportunities. The lovely ladies from Charity Angels and Crown Diva Boutique & Pageant Academy sold raffle tickets throughout the evening, benefitting the cause. Guests had the opportunity to win spectacular prizes. A true highlight of the evening was the Charitable Live Auction. Sparkling Hill Resort, a European-inspired wellness resort known as the first resort in the world to incorporate Swarovski crystal elements into every aspect of its design, stood out. The winner of this Live Auction Item received a gift certificate for a 5 night Couples Escape in a stunning penthouse suite, with access to a wide range of wellness treatments featured at the resort’s world-renowned Kurspa – a 40,000 square foot spa providing over 100 treatments and therapies. The Sugar Ray Leonard Foundation was launched by boxing legend and six-time world champion Sugar Ray Leonard to benefit the Juvenile Diabetes Research. The mission of The Sugar Ray Leonard Foundation (SRLF) is to find a cure for diabetes and its complications through the support of research. After watching his father struggle with Diabetes and its complications for years, Ray is very passionate about finding a cure for Juvenile Diabetes. Ray is also very passionate about empowering wounded warriors dealing with post-traumatic stress disorder and other lasting effects of combat. Part of the proceeds from this event go to the Wounded Warrior Project (WWP). For more information about the Foundation and their cause, please visit SugarRayLeonard.com.